This Excellent Vacation Home is of the Excellent Standard category. 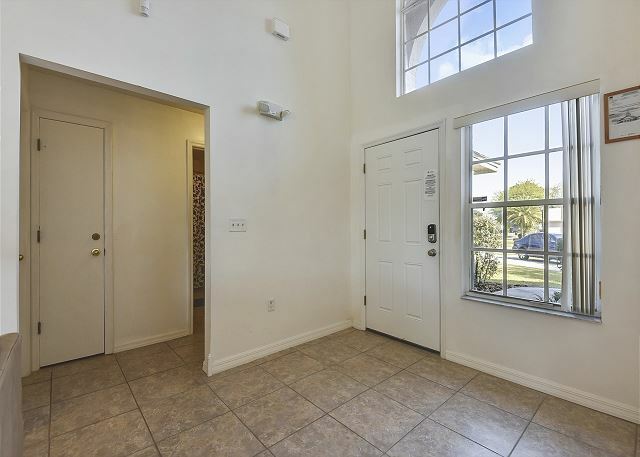 The villa is situated at the end of a quiet cul-de-sac (no through traffic) in the Blue Ridge sub-division in Southchase, Orlando, close to the intersection of SR417 (Greeneway) and Orange Blossom Trail. It is therefore only minutes to the Walt Disney World, Universal Studios and Sea World theme parks plus some of the world’s best golf courses. There are supermarkets and dining (both formal and informal) nearby. Everything you could possibly need really is close at hand. This villa offers free high-speed internet (cable and Wi-Fi) plus free local and long-distance calling within the United States and Canada. The villa has plenty extras to make your stay very enjoyable. It has been furnished to a good standard. When entering the villa the living room is straight ahead, with the dining room, kitchen and breakfast corner to the left of it, the 3 bedrooms to the right. 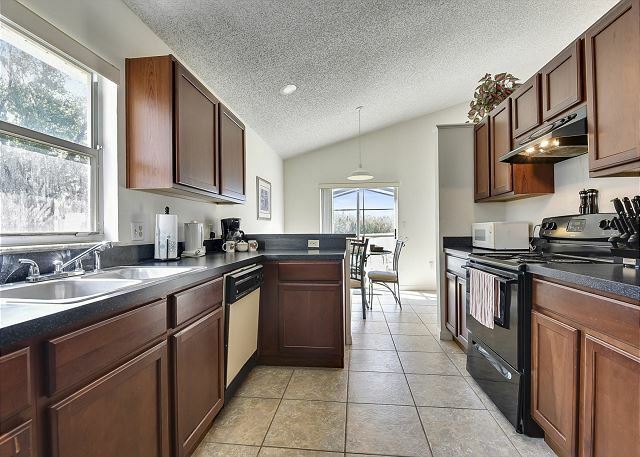 There is a spacious, very well fitted kitchen. The breakfast corner, living room and Master bedroom all look onto the pool area. 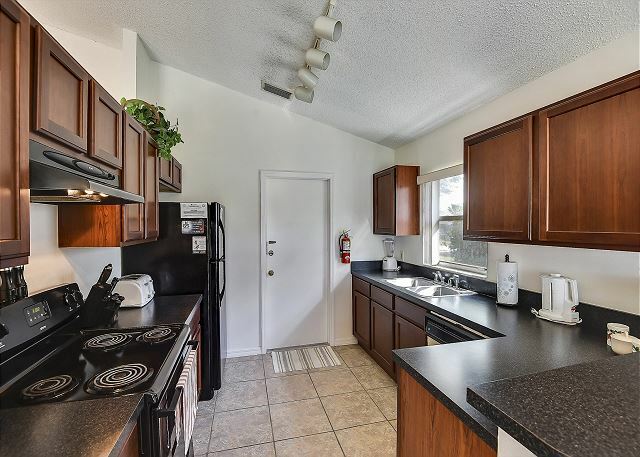 From the kitchen you have access to the garage where the washing machine and dryer are located. Iron and ironing board are present too. The kitchen includes a full size oven, microwave, large fridge-freezer, waste disposal unit and dishwasher. There is also a full range of electrical appliances and utensils – pretty much everything you could want in your home away from home. The breakfast area is right next to the kitchen. The living room with digital cable TV leads through the sliding patio doors to swimming pool area, with fences on both sides for your privacy and open in the back, offering a wide view of the large pond behind the villa. Pool deck chairs and sun loungers allow for late night, pool side relaxing. 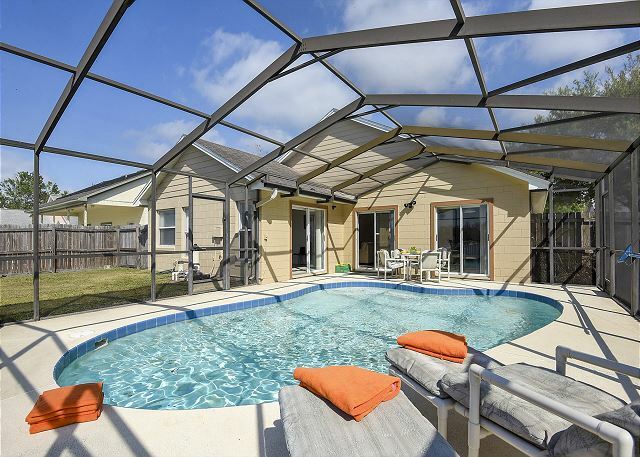 The pool at this home is heated by direct sunlight only; additional pool heating is not available at this time. On the right, next to the living room area, you will find the three bedrooms. 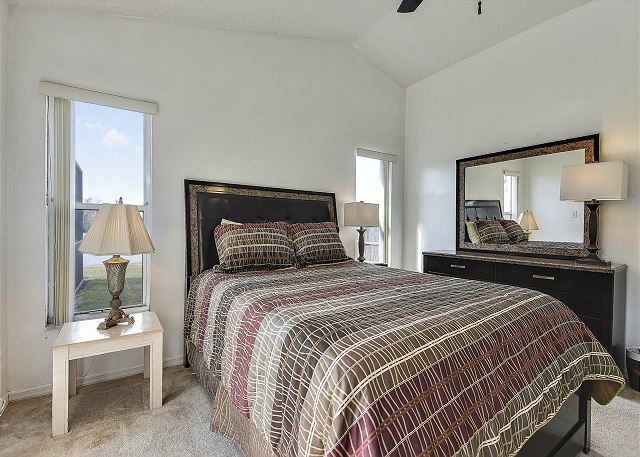 The master bedroom with Queen Bed is in the rear, with large walk-in closet and the en suite bath room, with vanity, garden tub with shower and toilet. This bedroom has cable TV. 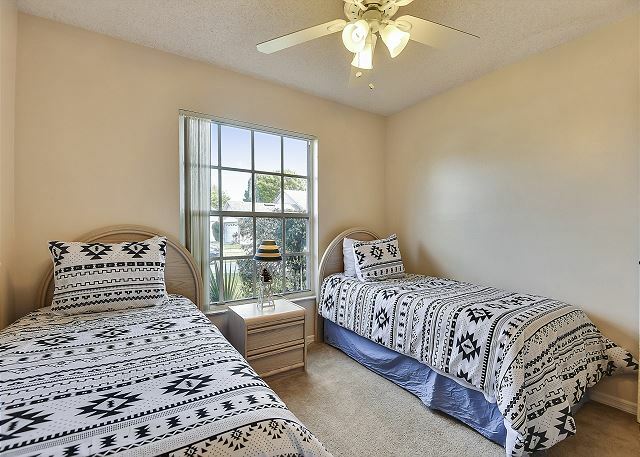 The other two bedrooms have 2 Single Beds each and their own closets. 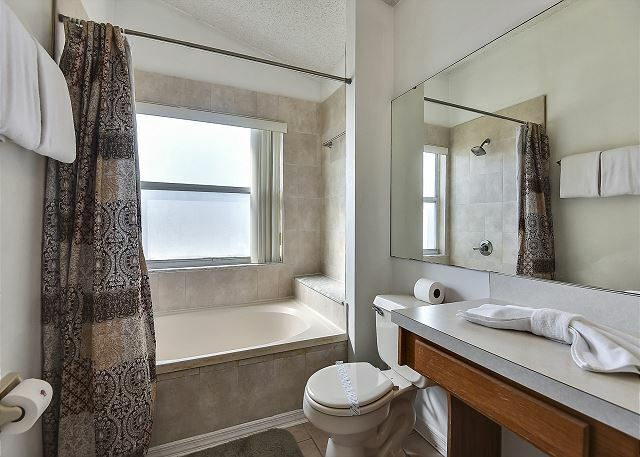 The shared bathroom for these bedrooms is right in between them, and has a vanity, shower tub and toilet. 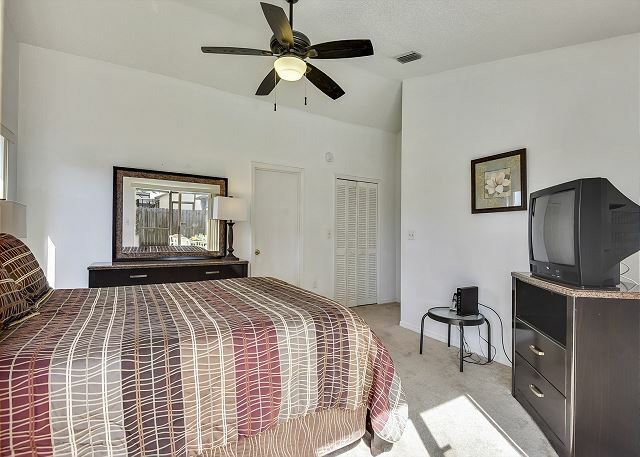 All bedrooms and the living room have ceiling fans. As Excellent Vacation Homes is the local management company looking after this property 365 days a year, any technical or other issue is usually prevented before it even gets a chance to develop. But, our 24-hour cover service is always available should you require it during your stay. The villa is fully air conditioned for those very hot days and has reverse air for those colder days. A remotely monitored alarm system is present to give you that extra peace of mind. Very nice house. Pool was very nice. Very clean. Washer and dryer is a plus! Hi Saul, thank you for your wonderful review. Glad you and your family enjoyed your stay. We look forward to welcoming you again the next time you visit the Orlando area. Hello Tabitha, thank you for your wonderful review, we look forward to your return to the Orlando area. Nice house ! Great location! Stayed a week at the beginning of June and loved it. The house is 15-40 minutes from all the major parks with Sea World being the closest. Hello Keith, Thank you for a great review and we're glad you enjoyed your stay. We look forward to welcoming you the next time you visit the Central Florida area! We had a good stay, the premise has a very good location with the required infrastructure, Walmart, Airport, parks etc. Enough space for 6-7 persons. The pool finish and the kitchen equipment was behind our expectation. Hello Volker, thank you for review and for staying at this wonderful lake view pool home. We would love to welcome you again on your next visit to Central Florida! Hello Shannon, Thank you for a great review and we're glad you enjoyed your stay. Thanks again and we look forward to welcoming you in the future!! The house is an excellent value for extended stay guests such as ourselves. We rented the house for 12 days and were very satisfied with the overall experience (price, location, ameneties, etc.) This was a vacation/work getaway for me thus I relied heavily on the in home WIFI network. The network was able to handle my companies VPN connection without an issue as well as all the connected devices (phones, iPads,etc.). 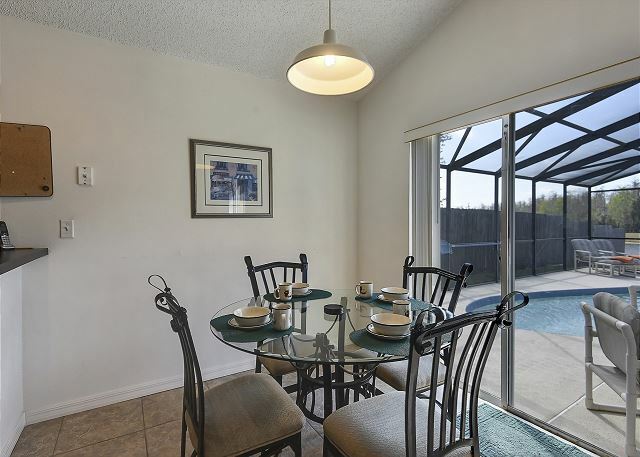 The house is situated close to the airport (less than 8 miles) as well as all the Orlando attractions. It's also close to several grocery stores, drug stores and numerous local and chain restaurants. Overall, we were very satisfied with the house. Christopher, thank you so much for your review & feedback. 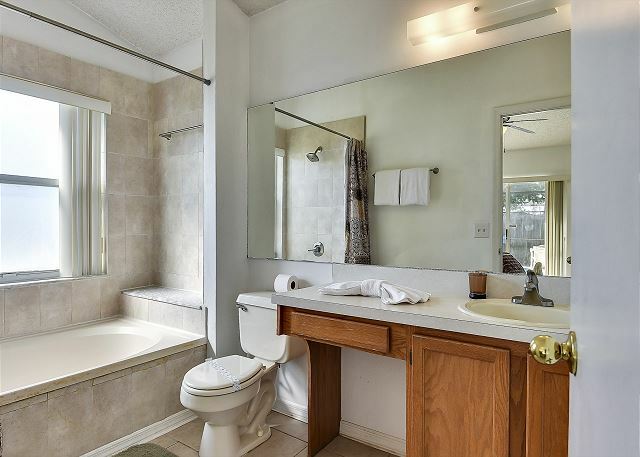 Glad you enjoyed this centrally located house with private pool and lake view. We would love to welcome you and your family again on your next visit to the Central Florida area! 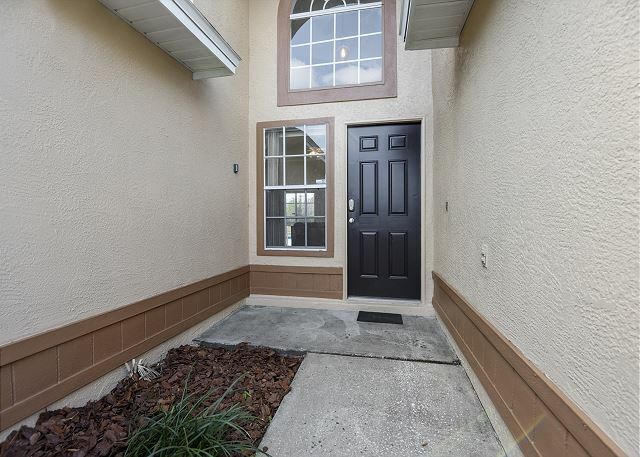 Overall the location of this property in Orlando was great. We were about 15-30 minutes from parks and attractions anywhere in Orlando and had quick access to lots of dinning options. The neighborhood was nice, and despite our intentions to bring the trash and recycling to the curb ourselves, someone kept magically doing it for us. The building was in good working order and having the laundry was a big help. Value wise this was a great choice for my wife and our traveling companion. 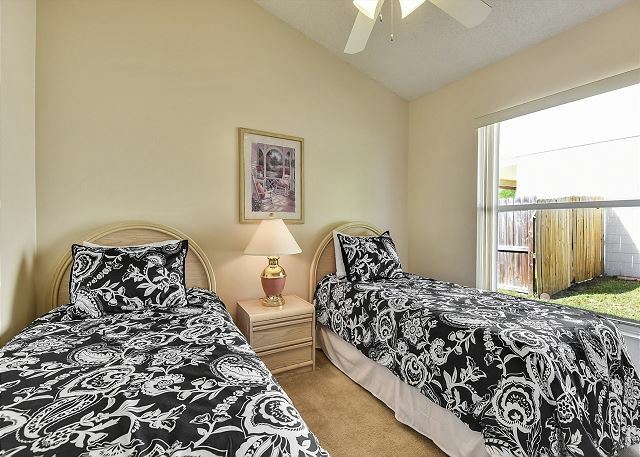 We only needed 2 of the 3 bedrooms, but having the 2 bathrooms was great. It is a self-catered place, so we hit the Publix around the corner to stock up on laundry soap, dishwasher pods and other basics to have on hand. We made use of the full kitchen to do some baking and to make some nice meals. While overall the pace was clean, it could benefit from a deep clean at some point. The air registers,walls and some of the cookware hadn't seen a deep clean in a while by our assessment. The pool was a little chilly in early March, but it was nice just hanging by the pool and watching the birds over the pond. The garage was filled with a ping pong table, which I guess we could have moved if we wanted to drive in, but we chose to play ping pong and park in the driveway. 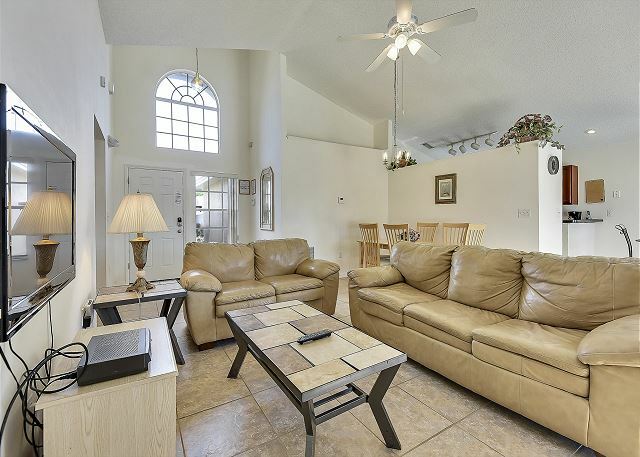 I would recommend this property for any group planing a week or longer stay in the Orlando area. Thank you Phillip for a great review score. Glad you enjoyed this wonderful vacation home. We look forward to welcoming you again in the future! We rented this home for 7 days as our base for Disney/Lego Land/Beach. Very adequate. Comfy beds, quiet neighborhood. Pool not heated. Could use a few more amenities, i.e. washcloths and soap. Overall very nice for the price. Hello Jeanne, thank you for your review and feedback. We apologize that you were disappointed by the fact that this pool is not heated. We look forward to your next visit in one of our many homes with a heated pool and/or spa. Much space, clean rooms, good location.. What more can i say..
Hello Steffen, thank you for this excellent review. Glad you enjoyed your stay at this Excellent Vacation Home! Please come back and see us next time you visit Orlando. 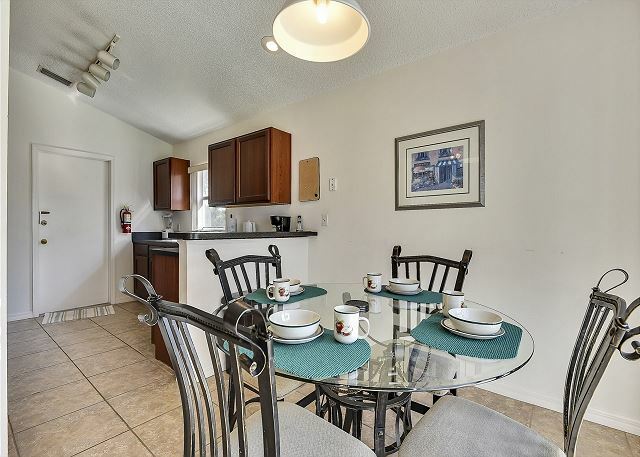 Great location and access to parks and amenities. The house needs some updates. Air conditioning would freeze up under 74 degrees. The carpets were old and needed cleaning. The walls were clean, but had some old stains and needed painting. Had a great vacation.. management company is the best I've ever dealt with. service is top notch. Pool could use some updating . Ping pong table is the best. Hi Allen, it's always a pleasure to welcome you back again!! Thank you for a great review & your feedback. We look forward to welcoming you again next year. The home is not bad, but the bed was uncomfortable, and the sheets did not smelled good, the house smells like there is a humidity issue. We stayed in the vacation home for 7 days. Overall it was a comfortable stay. The house is in a nice and quiet neighborhood, restaurants and a supermarket are close. One negative point...the small bathroom could be a bit cleaner at arrival. The shower curtain was dirty and there was a sewer smell. Sanne, thank you for your review. We appreciate your feedback and look forward to welcoming you the next time you visit the Central Florida area!! Our stay at Blue Ridge in Orlando was great. The house was adequate but has the potential to be great with some paint well applied, and a power washer for the outside of the house..particularly windows and pool deck. The location of the house is excellent. Easy, short trip to Disney, sea World, Universal studios, restaurants and shopping were appreciated. The kitchen could use a casserole dish or two but otherwise quite workable. The management company, was great and very professional. We had an air conditioner problem when we arrived and the company had a rep at the house within half an hour of our call. We had air conditioning within 2 hours. I would certainly recommend this property. Wendy, thank you for your review. We appreciate your feedback. I'm glad the a/c was fixed in a timely manner. It only takes a quick phone call and we will take care of any issues. We look forward to welcoming you the next time you visit the Central Florida area!! When we arrived the house was clean and well kept. The pool was perfect and everything was exactly what we expected. We did not have to call management a single time. 10/10 would rent again. James, thank you for an all excellent review. We are happy you enjoyed this home. We look forward to welcoming you again in the future! Overall a good place to stay, we would stay there again. The house could use a little tlc but otherwise it was all right. The location is great, close to everything!!!! Hi Manon, thank you for a great review. We are happy you enjoyed this home. We look forward to welcoming you again in the future. We stayed in the villa for 2 weeks and it was perfect for our needs. It is in a great location with everything really close by. The aircon was a godsend as it was very humid for the first week. It could have been a bit cleaner though. The sofas were dirty with biscuits and rubbish underneath the cushions and the bedspread in the main bedroom had crusty white stains on also the pool deck could've done with a jet wash.That said, I would definitely stay there again and I would recommend it. maison propre,trois (3) chambres a coucher,2 salles de bain.belle piscine prive ce qui est regrettable,elle n'a pas de chauffe eau ni de toile solaire.Les vitres de la maison tres sales,manque d'ustensiles,(fourchettes,cuillere a cafe,etc).manquait balai pour le nettoyage. Celine, thank you for your review and feedback. A call to the office and we would of supplied more utensils and a broom. We look forward to welcoming you again! Dear Harold, thank you for a great review. As the homes are self catering, we provide paper products and laundry and dish detergent for the first day to give you a head start. We are glad you enjoyed your stay with us and we look forward to welcoming you again in the future. Hi Denise, thank you for an excellent review. Glad you enjoyed this wonderful vacation home and we look forward to welcoming you again ! a. In the main bathroom there was a verey good shower with good warm water. In the washing stand was no warm water, even not after 10 minutes streaming. Thank you Jacques for a great review and your patience during Hurricane Irma. Glad you enjoyed this wonderful home and we look forward to welcoming you again the next time you visit the area! We took our parents back to the Orlando area after moving away 45 years ago. We needed a central location to revisit all of our childhood places of interest in a home that would accommodate the family. The home was spacious and well laid out. We liked the convenience of nearby restaurants and a nice supermarket when we did not want to eat out. The kitchen was well stocked and we enjoyed the pool after sightseeing all day. 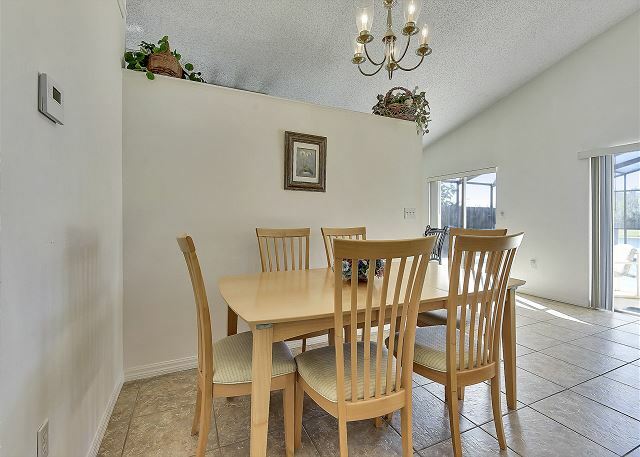 There were a few minor items that need attention but overall the house is well maintained. We would definitely stay here again. Hi Tina, thank you for a great review and I'm happy to hear you could bring back childhood memories with your family. Glad you enjoyed this wonderful vacation home and we look forward to welcoming you again ! Vacation rental was in a great location. 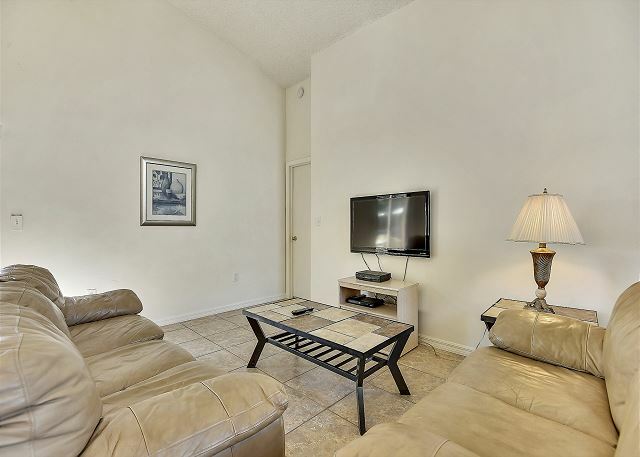 Easy access to stores, movie theater, and theme parks. Home was clean and in good shape. We had some visitors from sandhill cranes in the back yard. It was pretty awesome. I would stay there again. Thank you for providing your home for our vacation. Thank you Rosa for an excellent review score. Glad you enjoyed the house and we look forward to welcoming you again in the future! Very nice, enjoyed our stay. Hello Monique, thank you so much for your great review. Glad you enjoyed this wonderful vacation home with a private pool. We look forward to seeing you again next time! I enjoy the peace and quiet away from the noisy city .In the morning I enjoy home made breakfast and gazing out at the beautiful, lush green background of the lake and pool and the glittering sunlight upon the water enhancing a spiritually,uplifting feeling of God and nature . Hello Betty, thank you for a great review. We are happy you enjoyed this home. We look forward to welcoming you again in the future. The rental process was fine. I was just disappointed upon entrance to the home. The walls were dirty, the master bathroom tub had a slow drain. The pool was looks like it needs to be resurfaced. Then if you leave more than a bag of trash they say inform you of a $45 charge for more trash. The light that is on the front of the house keep coming on and off even if you were standing out front. Light fixtures had burn stains and plugs didn't work. I have stay in much nicer units than this one. Dear Riann, sorry to hear your experience was not fully meeting your expectations. We have taken your feedback to heart and started to address some of the concerns mentioned. We have touched up the paint on various walls (you were most likely looking at scuff marks, typically caused by suit cases when dragged along walls in hallways). The slow drain is an easy fix (piece of a bar of soap stuck in it). Please next time just call it in so we may address that on the spot, really for your convenience. We have also addressed the motion sensor on the lights above the font door. Thank you for making us aware. As we hardly ever visit our properties in the dark, we would not have known for a long time, really only if someone points it out to us like you now did. The trash guideline may come across a bit harsh, yet is really there for longer stay guests (multiple weeks), to emphasize the need for trash to go out on a weekly basis, to prevent the cleaners from getting stuck with tons of trash inside the house, on a guest departure day, with no means to take it anywhere. Our apologies if this came across too strict for your liking. Thank you again for your constructive feedback, and we hope to have the opportunity to welcome you again in the future. Very clean property, very attentive staff - couldn't find the towels on the first day, but eventually found them in the airing cupboard(!) - staff rang moments later much to our chagrin...doh. We were lucky with the weather and moments by the pool with squirrels running around the screens were fun. Would recommend this property very highly. Dear Louise, thank you for a great review. Glad you enjoyed this wonderful vacation home. 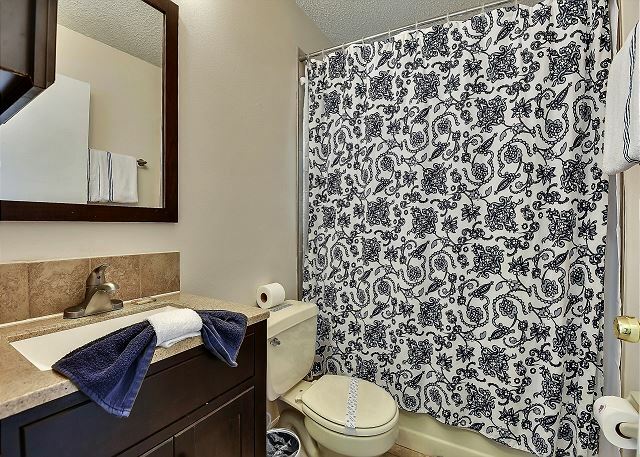 No worries about phone call where you were asking for more towels; the home has many closets and cupboards so yes, it does take a little bit to familiarize oneself with all its contents. We look forward to welcoming you again in the future. The house is located in a quiet residential suburb. Location was not far from shopping and theme parks. The house was clean and in good condition. Everything worked just fine. Nice pool, just needs some paint. Very good price for what 's on offer! Dear Gerben, thank you for a great review. Glad you enjoyed this wonderful home and all the area has to offer. Point taken on the pool; the pool bottom shows some discolorations in the concrete, built up over the years. The home owner is currently considering resurfacing the pool to make it look 100% again. Thanks again and we look forward to welcoming you again in the future. Definately a great place for the price! Not a bad location either. Relatively short distance away from all activities!! Dear Mark, thank you for a great review. Glad you enjoyed this great value and location. We look forward to welcoming you again in the future! Dear Amanda, thank you for your review and feedback. We appreciate your points regarding the cleanliness and hope that during a next visit you will contact us immediately as the items indicated by you are well below our standards and would have been corrected right away if pointed out to us. Also, every property is treated very regularly to prevent pest issues in the first place. However htis being Florida cannot prevent a few bugs entering the house every now and then but when pointed out to our Guest Services during yor stay our pest control team will come by and do an extra treatment, on the spot. We are happy to read that these issues did not take away too much of your overall experience as you are indicating that you still highly recommend this wonderful home and would definitely use it again in the future. We look forward to welcoming you again next time you visit the area. Very good, but a couple of suggestions. We were expecting TV with cable in each room. The living room only had it which was dissappointing. The twin bedrooms can use new mattresses. And the couch in the living room was very uncomfortable. I would still hoghly recommend this property and the company for a quality experience. Dear Christopher, thank you for your review and feedback. Sorry we did not meet your expectations regarding TVs in each bedroom. Please note that the home is advertised with a flatscreen in the family room and only one other TV in the master bedroom. Your comment about the matresses must be the result of personal preference, as all matresses in this wonderful vacation home are brand new as of this last January (2013), and are said (by other guests since then) to be very comfortable. Thank you again and we look forward to welcoming you in the future. Dear Tina, thank you for an excellent review score. We look forward to welcoming you again in the future! 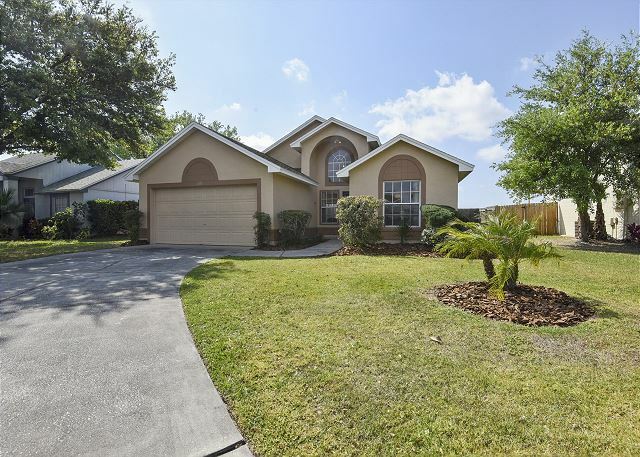 Would recomend this property to any one going to the Orlando area. Quiet neighborhood, Clean area, the house was perfect for our needs. Dear Teresa, thank you for an excellent review score. We are happy to read you enjoyed your stay and we look forward to welcoming you again in the future. Everything was a-okay! Nice house, nice neighbourhood. Everything clean. Only small issue: I think there is something wrong with the internet, at times it didn't work, at times it was very very slow. Dear Folko, thank you for an excellent review score. Glad you enjoyed this wonderful home and we look forward to welcoming you again in the future! First time ever online renting. I would recommend Tripadvisor, Excellent Vacation Homes to anyone. I will be contacting them for our next vacation. Thanks for everything. Very nice people to talk with and help you if you need anything. Hi Lisa, thank you for an excellent review. Glad you enjoyed this wonderful vacation home and we look forward to welcoming you again ! We thoroughly enjoyed our stay. Girls loved the pool in the backyard and mom and dad loved the fact that it was fenced in and we could see them from the kitchen. Publix groceries close by as well as Dunkin Donuts, Target and Walmart. We were about 10 minutes from Disney, Seaworld, Aquatica, Discovery Cove and outlet mall. Can't say enough, quiet area-hope to be back soon!!!! Hi Angela, thank you for a great review. Glad you enjoyed this wonderful vacation home and we look forward to welcoming you again ! Hi Patricia, thank you for a great review! Glad you enjoyed your stay at this great home and we look forward to welcoming you again in the future! We had a very nice stay in this vacation home, everything what we needed was there and also there was enough space for our two kids and for us. The mattress in the king size bed was wonderful - with memory foam - I loved it!! The location was perfect for us to make sight seeing, shopping etc. We would stay hier again at our next visit! Dear Hamad, thank you for a great review. Glad you enjoyed this wonderful vacation home. We look forward to welcoming you again in the future. Nice house in a mostly quiet area, although traffic noise could sometimes be heard. Nothing like the noise in a hotel though. Nice bed, plenty of room, and easy to get to attractions from this location. Swimming pool was fantastic (made for a great morning view while eating breakfast). We won't be staying in a hotel when we travel to Orlando again. Dear Albert, thank you for an excellent review score. We look forward to welcoming you again in the future! only complaint was no tv in bedromms except master. 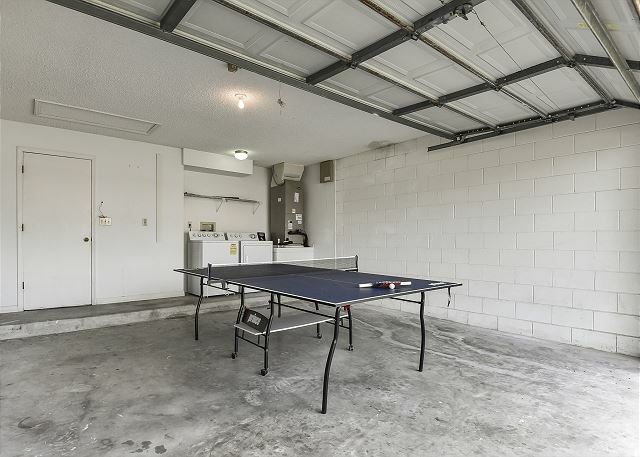 no ping pong or pool table in garage. no big thing just would be good. especially liked view. Richard, thank you so much for your great review. Glad you enjoyed the house with private pool. We look forward to welcoming you again the next time you visit the Central Florida area! Property was clean and well equiped. Very close to malls, restaurants, etc. We had a great time and the house was a big part of it. We only have small complains: No recycle bin was provided and the pool needs to be repainted. Other than that, it's a lovely house and the price is great! Dear Maria thank you very much for a great review! We are glad you enjoyed this great vacation home and look forward to welcoming you again in the future. All was fine. Some minor improvement points: management of the alarms should be better explained and the swiming pool could be repainted. Melanie, thank you for an all excellent review. We are happy you enjoyed this home. We look forward to welcoming you again in the future. Good location to the conference we were going to. Hi Sherry, thank you for your great review. We look forward to welcoming you again next time you visit the Orlando area! Hi Calvin, thank you for an excellent review. Glad you enjoyed this wonderful vacation home and we look forward to welcoming you again ! The house was just as expected a nice well located with all of the amenities of home. The house was clean and even had some chocalets upon our arrival. I stayed for two weeks and in the two weeks I only had issue with the pool light which they fixed right away. The only suggestion to the managers is to place two floodlights one in the front may on top of the garage door and another one in the back in the yard it gets very dark in both places. Otherwise you have to keep in mind is a vacation rental so for the price, size, and location is simple unbeatable. Will most likely come back. Thank you Vivian for a great review. 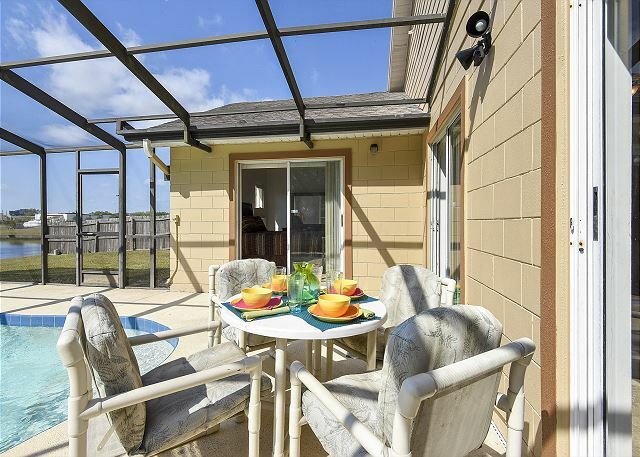 Glad you enjoyed this wonderful home and we look forward to welcoming you again the next time you visit Central Florida! House was very clean and was close to shopping,restaurants,sea world and only complaint was the pool needed to be cleaned. Thank you Maureen for your review. I wish you would of called the office about the pool. I'm glad you enjoyed this wonderful home and we look forward to welcoming you again the next time you visit Central Florida! Thank you Guadalupe for an excellent review. Glad you enjoyed this wonderful home and we look forward to welcoming you again the next time you visit Central Florida! Hello Kamal, thank you for an excellent review. Glad you enjoyed this wonderful vacation home and we look forward to welcoming you again ! Had a great time at the house, Everything was as advertised,house was very clean, quality of the furnishing was excellent, the location was great, we were near plenty of stores, the check in and check out process was very efficient. I would recommend this home to anyone. My family could not believe the price I paid, less than a hotel room per night. Hi Carol, thank you for an excellent review! Glad you enjoyed your stay at this great home and we look forward to welcoming you again in the future! 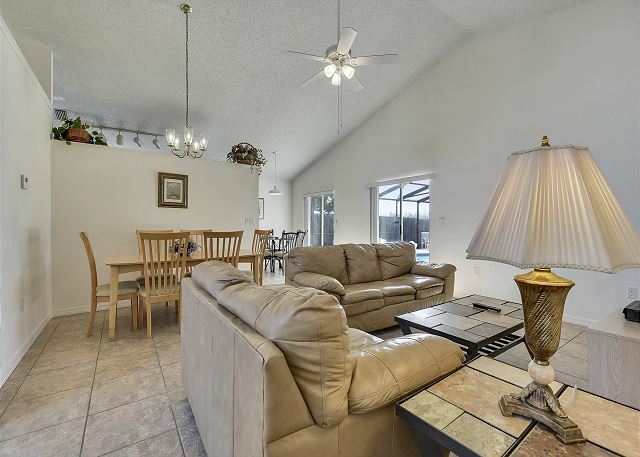 The home was well maintained, located in a very prominent area to access surrounding attractions and, convenience having all items within your own home for comfort. I would strongly recommend this location and personnel whom assisted with procuring this beautiful vacation spot. Thank you Anibal for this excellent review. We are happy you and your family enjoyed your stay and look forward to seeing you again in the future. We loved the house!! It was perfect for what we needed. There were two pieces of the blind in the master room and one piece in the living room that were fallen off. We were caught off guard when the pool man came the clean the pool, we werent aware that he was coming. Otherwise everything was great, the location was great and we enjoyed ourselves! We will definitely look to rent again! Tania, thank you for an excellent review. We are happy that you enjoyed this wonderful vacation home and look forward to welcoming you again in the future! Biggest issue was not having hot water,, nice big tub but unable to use as water temp was not adequate. Blinds need to be replaced, they constantly fell when used, no matter what I did. Pool needs to be painted. There are stains that need to be fixed so pool doesn't look dirty. Garage could be cleaned up as well, old art work, some small items that appeared to be trash against the wall. Nice Orlando property. Good central location and nice house. Great for families to gather. Kandy, thank you for a great review. Glad you enjoyed this wonderful vacation home and we look forward to welcoming you again ! IT WAS 9:OOPM SATURDAY, AND FOR MISTAKE I DELETE THE INFO IN MY GPS..INCLUDING OF CORSE THE ADRESS OF MY RENTED HOME. I CALL "REMBER" THE PERSON WHO HELPED ME THRU THE RENT PROCESS AND IN ABOUT 3 MIN. HE RETURNED MY CALL HELPING ME WITH THE ADRESS. EXCELLENT SERVICE!! THANK YOU VERY MUCH. I DEFINITELY RECOMMEND THEM 100%. Hi Alba, glad you enjoyed your stay! Thank you for sharing the example of a service request during non-office hours; it is exactly why travelers often prefer to book a home with a professional Vacation Home Management company (like us); we are on calll 24/7, because you never know when a need for assistance arises. Hope to welcome you again soon. Hi Louise, thank you very much for your feedback. Wow, sorry to hear that you had an ant problem and that the space under the bed was missed during the vacuum. In the event that something like this would occur again, please call us so we may correct such a mistake immediately. We take your feedback to heart and will add some storage dishes to the, other than that, well-equipped kitchen. A TV in each bedroom is recommended more often, and up to the home owner for consideration. If any are added we will update the listing details stating that bonus feature. We hope we may welcome you back next time you visit the area! House was in an excellent location but furnishings, especially mattresses were cheap and not very comfortable. House lacked enough towels. Dear Alfredo, thank you very much for this review. As each house should have enough towels for your use, we have done a recount after your departure and even though the inventory matched our guideline we decided to add a few extra. Next time just give us a call so we can correct this while you are here. We understand mattresses are very personal where it comes to preference for a degree of firmness. Most of our mattresses are of a medium to hard firmness, simply because the softer ones loose their firmness all together too quickly. Thanks again for staying that whole month with us and we look forward to seeing you again! This was a wonderful home in a wonderful location in Orlando. We only had one problem and that was with the shower in the master bathroom. But since we just used the other shower it did not matter to us. I did however leave a note upon our departure. I would stay there again anytime I was in Orlando. Dear Maureen, thank you very much for your great review. The issue with the shower in the master bath had a very easy solution; the hot and cold water supply for this shower were reversed, so if you would have turned the knob the other way (towards 'cold') you actually would have received the hot water... Please accept our apologies if that caused any inconvenience. Next time anything comes up during your stay, simply call us as we are available 24/7 to attend to possible concerns. We look forward to seeing you again! Dear Kenneth, thank you for a great review score. We look forward to welcoming you back when you visit next year's tradeshow for your industry! ants in the kitchen seem to be the only problem...not a dealbreaker just make sure you clean up and take out the trash every night. Thanks Adam for your great feedback. So ants seem to be a problem again now that the weather offers very little rain. The best way indeed to keep them out is to clean up and take the trash out daily. We have now also caulked a few tiny hair cracks in the seal around the kitchen window which may have allowed the ants inside a bit too easilly in the first place. Thanks again and we look forward to welcoming you again. I would choose this home rental over a hotel room 10 times out of 10. 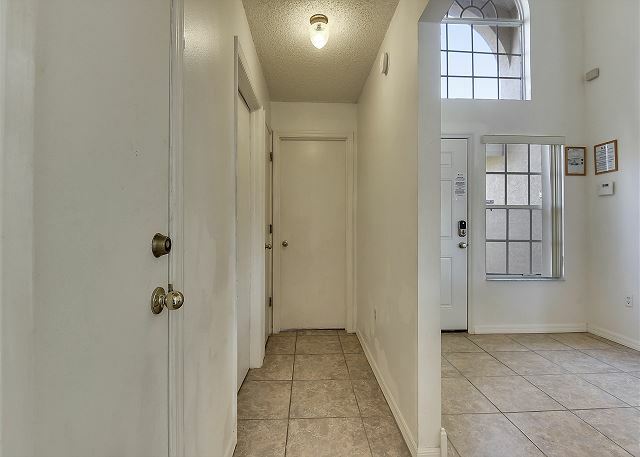 Clean, conveniently close to Universal Studios and affordable! Dear James, thank you for an excellent review score. Glad you enjoyed this wonderful home and we look forward to welcoming you again in the future! The home was comfortable and and the furnishing were nice,but needs some updates. The carpet was dirty and the stove burners needed cleaning. A little mold in the master bath tub;a poor repair on the tile. Did not get to enjoy the pool because of the weather. Dear Jayne, thank you very much for your review and constructive feedback. 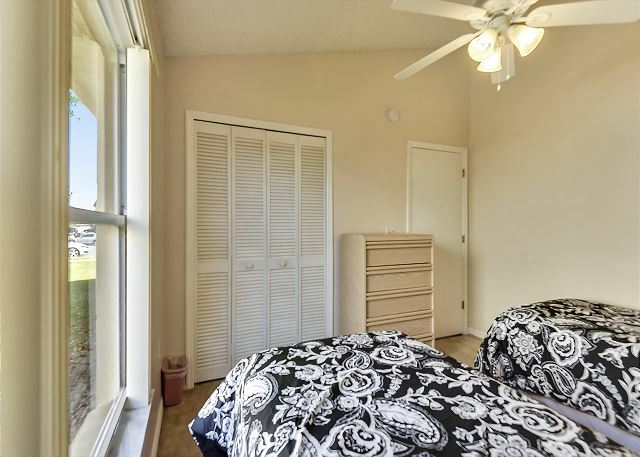 This home is in the process of updating: the master bedroom was recently updated and next month (March) both bathrooms will be completely retiled and replumbed to create that more modern look. This work has been planned for some time but with the many confirmed bookings into this wonderful home we had to wait anothter month. This will take care of the tile repair concern too. Some carpet "stains" are actually cleaned areas but showing minor discolorations, left behind after deeper stain removal, which must be what you are referring too? Our apologies for the stove burners in need of cleaning; great feedback, thank you! We noticed that some grease residue on the flip side must have caused unnecessary burning of oil. We will make sure that during cleans we check the bottom side of each burner too. Thank you again and we look forward to welcoming you again the next time you visit the area.